The Church of Santa Maria Nuova has the characteristic style of the cistercense architecture prevailing in the ecclesiastical buildings of XIII century Gubbio. The facade is simple, but particularly elegant. At the inside of the church, on the skillful wall, lies a fresco called "La Madonna del belvedere" from 1413, realized by Ottaviano Nelli. He realized it after having achieved a technical and constructive maturity which allowed him to perform delightful works and to develop a definitive individuality of style. This has consecrated him as the exponent of the Gubbio school and the best artist in Umbria and Marche of first half of XV century. 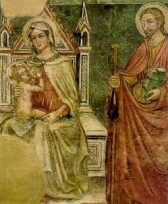 On the left wall an image of S.Antonio Abbate of the Palmerucci is found (XIV century). Guido Palmerucci is considered the best painter from Umbria of his period: to him several remerkable works are attributed.